Happy Fourth of July! I'm sure your day is full of friends, fun and of course, food! Personally, I'll be at my mom's for a little Independence Day shindig but I'll be bringing along these delicious Apple Pie Cookies! An American icon, this classic dessert is the perfect sweet treat to celebrate the 4th of July! 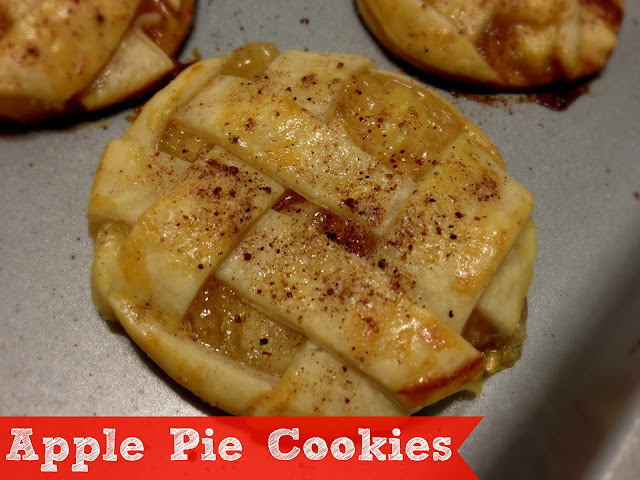 Though these pie cookie hybrids look tricky their actually very easy to put together! The recipe I used was of the semi-homemade variety but various ingredients used can easily be substituted for made from scratch supplies...i.e. caramel, pie crust, apple pie filling, etc. I can't wait to try these again with some homemade supplies! My stepmom makes the most incredible apple pies so if I can take that giant pie and shrink it into portable form I'll consider this a success. Or this could end up being a smidge of a problem for me since I'll be able to have these whenever I want...and able to take them on the go. Decisions decisions. What I love most about this recipe is that it calls for already made pie dough. Though I bake often I haven't yet tried to make my own pie dough, but I'm sure these cookies would be taken to the next level of amazingness if you happen to use your favorite pie dough recipe! Putting everything is a snap! 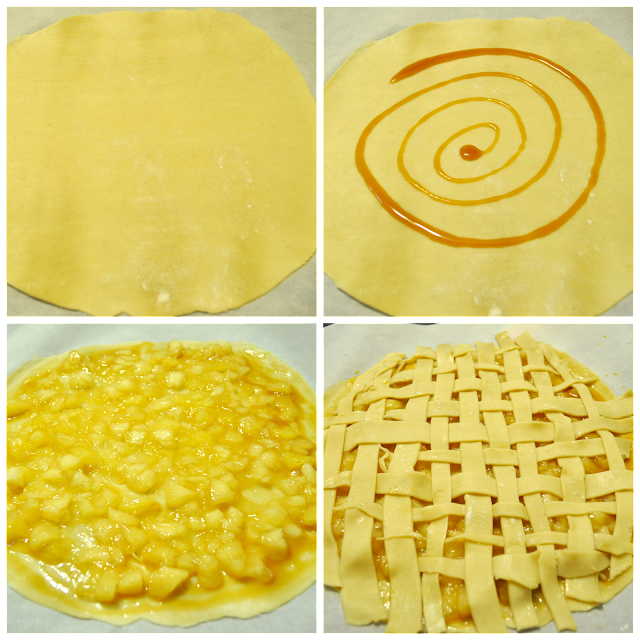 Roll out the dough a bit, add some caramel sauce, top it off with the apple pie filling and add the lattice pattern. I should have rolled my dough into more of a square/rectangle shape to make the lattice a little easier but it all worked out. In case you couldn't tell, it was my first time doing a pie lattice. In retrospect I probably should have just used a knife to cut the pie dough into strips instead of a pizza cutter. I'll have to remember this when I make up another three batches in the morning. Once the lattice is done it's time to cut out the cookies! To avoid having your cookie cutter or in my case, biscuit cutter, stick in the pie dip the cutter into your egg wash before each cut. I wanted to avoid my pie cookies falling apart when I moved them to a cookie sheet so as I used my biscuit cutter I turned it side-to-side to ensure all the surrounding dough had been cut. After you get all the cookies you can get from your "pie"use a spatula to transfer the cookie to the cookie sheet. 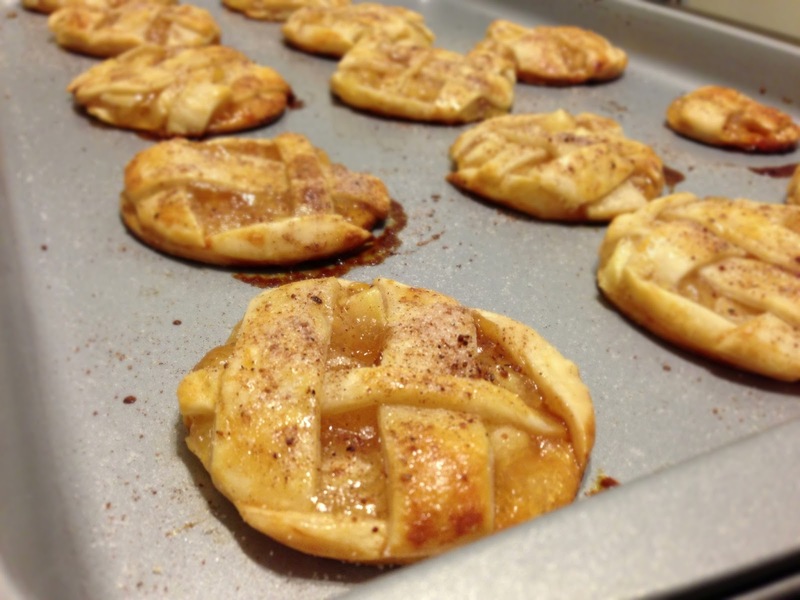 The cookies hold their shape pretty well but just be careful as the dough is a bit sticky and you could end up accidentally pulling the lattice off a surrounding cookie! All that's left is to egg wash the cookies, sprinkle your Cinna-Nutmeg-Sugar mix on top and pop 'em in the oven. The recipe I used called for 1 Tbsp. nutmeg which I thought was a LOT, so I'm dropping this recipe down to a tsp. The mixture was very nutmeg heavy so hopefully this will help even things out a little bit. Unless you're a nutmeg nut then do your thing! Oh, and try not to eat them straight out of the oven. My sister couldn't wait and ended up with a mouth full of piping hot apple filling. Not a great time for the roof of her mouth but she said it was worth it. If you want to get REAL CRAZY You could sandwich some vanilla ice cream between two of these cookies to make the ultimate Apple Pie a la Mode. Do it! It's a holiday, you deserve it! adapted from Oh Bite It! 1. Preheat oven to 350 degrees. 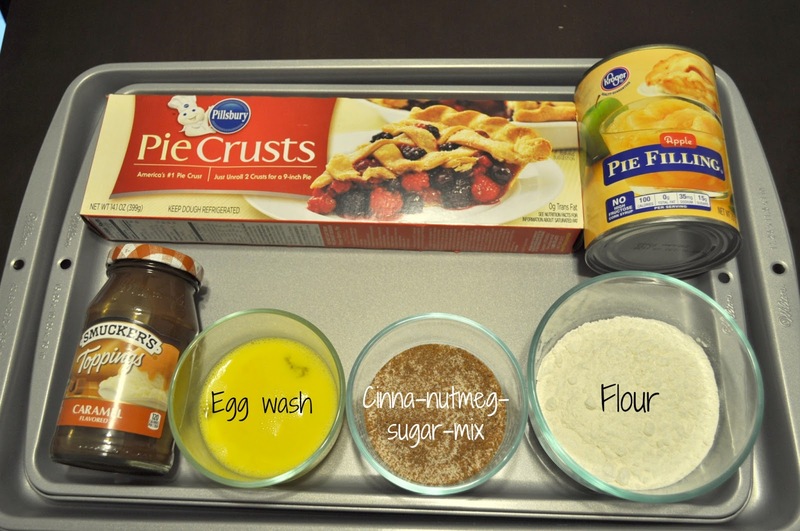 Lay out one of the pie crusts on parchment paper. Sprinkle some flour and roll out your pie crust slightly to make it bigger. To make things easier you might want to roll it into more of a square shape. 2. 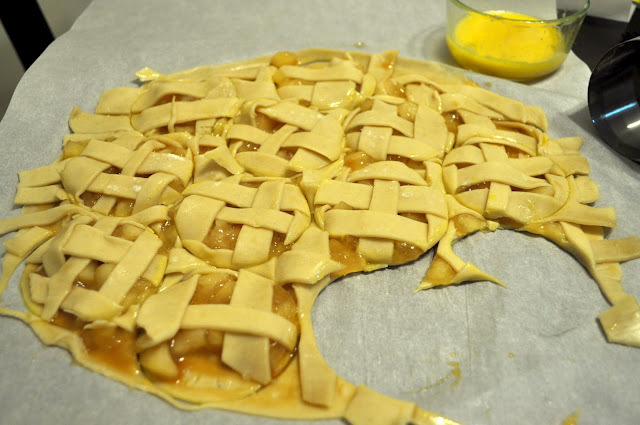 Pour your caramel sauce onto the pie crust and spread it evenly among the crust. 3. Take your pie filling and coarsely chop it to insure bite sized pieces. Add the chopped filling on top of the caramel crust and spread evenly ensuring that you do not add too much filling. 4. 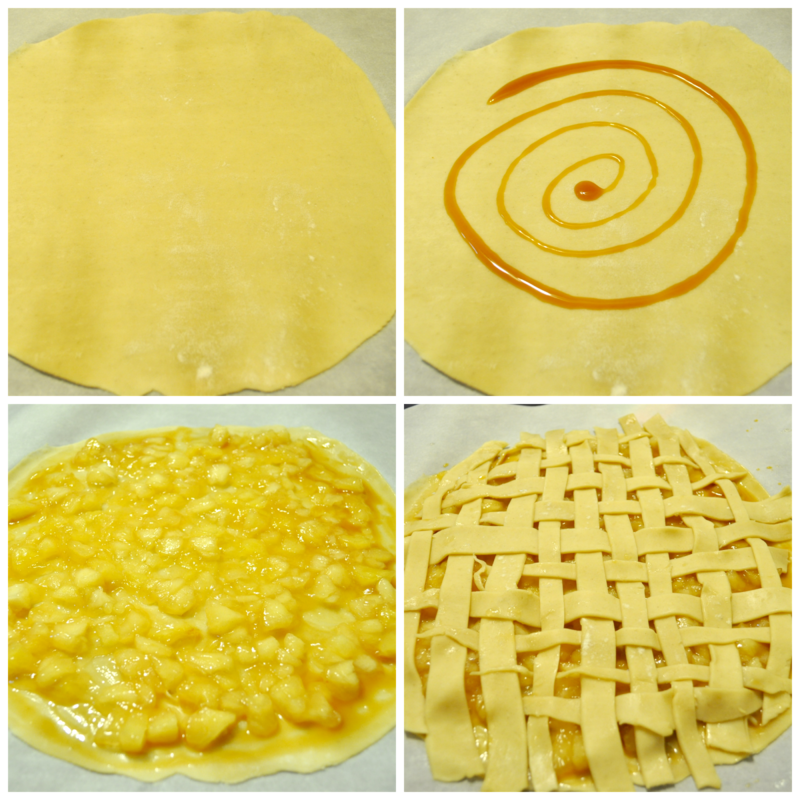 Roll out your second pie crust onto some parchment paper, try to make it the same size as the first pie crust. Cut this crust into stripes as it will be used for the lattice. 5. Top your pie filling with half your cut strips, the other half will be used to weave in the lattice. If you aren't familiar with this technique this how-to guide from Simply Recipes helped me out. 6. Mix your cinnamon, sugar and nutmeg together in a small bowl. 7. Dip your round cutter into the egg wash and begin cutting out your cookies. Make sure you cut all the way through the dough so your cookies don't stick when you try to transfer them to the cookie sheet. Brush the tops of the cookies with the egg wash and sprinkle your cinna-nutmeg-sugar mixture on top of each cookie. 8. Bake the cookies for 20-25 minutes until golden brown. 9. Let cool and get eating! I'm serious about that ice cream sandwich thing though, if someone tries it please let me know in the comments! These are so cute and they look delicious too! I am going to have to try my hand at making these.